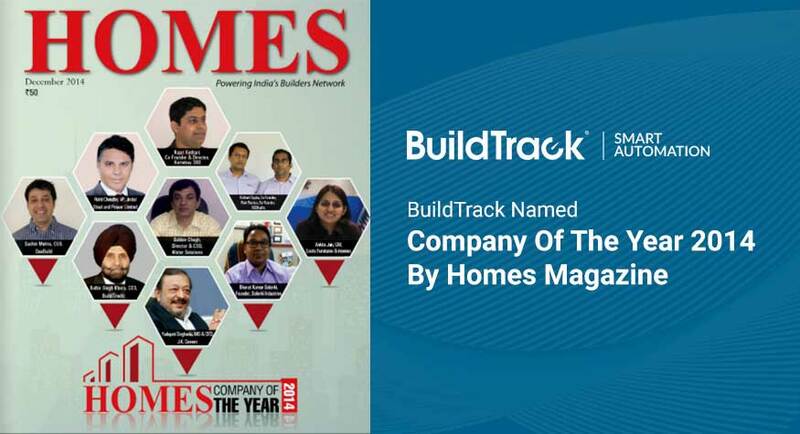 BUILDTRACK has been named as the Company of The Year 2014 under the ‘Home Automation’ category by one of the leading magazines in India, HOMES. Homes is a leading Pan India monthly magazine which provides builders, architects etc., with latest trends in construction and realty business, home building, news about new solutions in technology, security, green homes, sales and marketing, and building products and much more. The magazine has covered companies who have made significant changes and achievements in the respective categories like home automation, CRM services, interiors etc., in its December 2014 issue. BuildTrack has been chosen as the ‘Company of the year’ in the Home Automation category. The award is also accompanied by an article that talks about how BuildTrack is ‘Leading the Wave of Internet of Things’.